I always had a strange relationship with crossword puzzles because I never found an answer to any of the questions that are asked in the puzzles, so I was always looking at crossword puzzles as a blank grid. And they were staring at me, staring back as an unresolvable puzzle. That’s why I started to fill in the squares where letters are supposed to be, these letters constituting words, and replacing them by color and painting the whole grid over with brushstrokes instead of alphabet. By painting watercolor on the crossword puzzles, it’s like changing the rules. The crossword puzzle struck me as an interesting space for its geometric qualities and at the same time for its familiarity. Crossword puzzles, once they are painted, remain recognizable. And they become quite ambiguous. What are we looking at? Are we looking at a crossword puzzle? Are we looking at a small abstract painting? I was also interested in the fact that they are very small. For the most part, I was painting them quite quickly. And so in that very simple gesture, there was the possibility to make something ambiguous and complex, which is: cognitively, what are we looking at? And the way that these puzzles are painted is that we have color on the foreground. It’s not color that’s used to construct a space. We really have two realities, and one is in the foreground: it’s color. The familiar reality of the crossword puzzle is in the background. And that is fundamental to the way I work, even with my videos. The predominance of color as a language and as a filter is something that, since these earlier works on paper and some complex video productions, is very fundamental to the way I think about painting and the way I apply color. And in this situation, this particular situation, color functions as a code, another language, one that has its own repetition and rhythms. We don’t fully understand it but we do relate to it. And then I started realizing how many differences there were between different designs, so to speak, the way that the crossword puzzles were written and how, graphically, there were different types of numbers and different thickness of lines, and how the whole newspaper around it could leak some information. So I started collecting crossword puzzles from newspapers in languages that I didn’t know: Chinese, and Arabic, and so on, Russian, because the alphabets and the printing were so different and interesting. And I would go to this newsstand near my studio in Brooklyn and buy all these newspapers. And the person who sold them, after a while, looked at me and said, “Well, how many languages do you speak?” Well, I had to say that I would only paint the crossword puzzle. Stephen Dean seems to argue that underneath the world we think we know–the objects around us, and the people with whom we associate–lies a different universe, a universe of color. Throughout history, artists have been seduced by color, but Dean seems to have a unique relationship with this different universe. He speaks its language. His works read like anthropological field reports from a distant culture, like decoder rings for the cipher of color that surrounds us but that we never fully understand. Dean’s drawings seem simple at first. 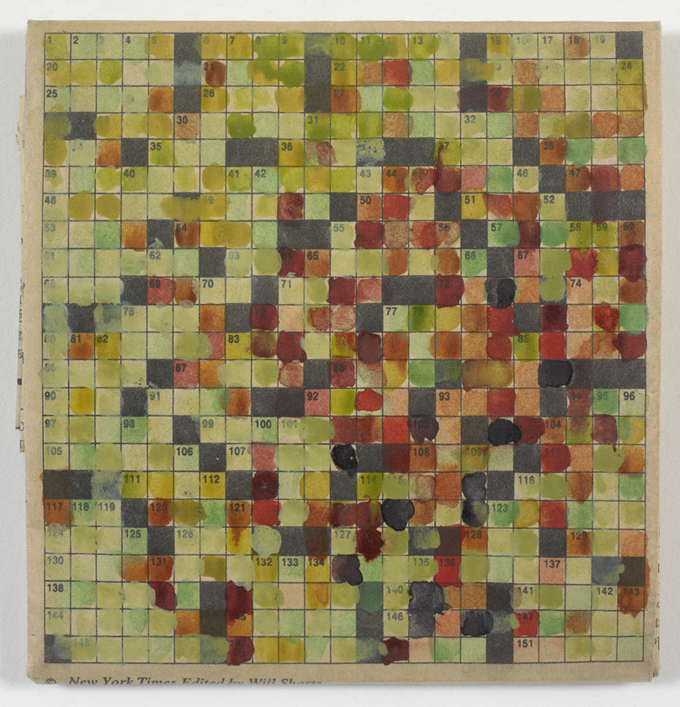 He takes crossword puzzles and help wanted sections from national newspapers and works into them with watercolor. The results are familiar objects defamiliarized, grids of hues and soft black newspaper ink often surrounded by quotidian text. They are lovely objects. The medium is sensitively modulated, with a range of densities and transparencies, each square a slightly different tone. This interplay of color and shade seems to shimmer on the page. The crossword puzzle works speak to the long history of the grid in minimal and post-minimal art, with Dean working into almost every pixel of the already intricate geometric puzzles. 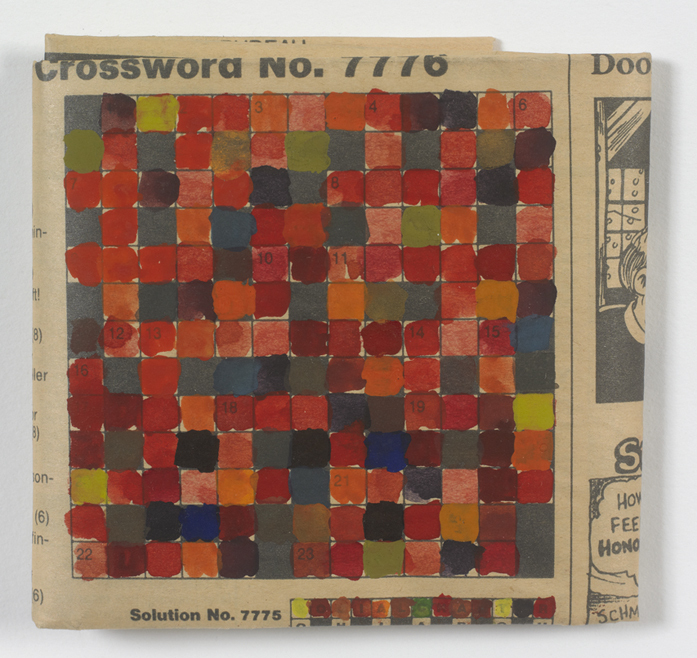 Each of the two crossword works in this exhibition has a particular emotional resonance due to Dean’s specific modulation of color. More than simply lovely objects though, these puzzles are also charged with meaning. One aspect of crossword puzzles that attracts Dean is their social element, that on any given morning thousands of people are working on the same puzzle published in that day’s newspaper, together-alone. The puzzles are a kind of fold in the continuum of space, linking people together without their necessarily being aware of it. His interventions into this quiet system—his reinvention of these puzzles and inscription onto them of the language of color—allows Dean to call attention to these links. By maintaining their siting within the folded newspaper sections in which he finds them, Dean explicitly points to the puzzles’ social power. The third watercolor by Dean in this exhibition further demonstrates his interest in human connection, in shared experience within unique experience. Untitled (Help Wanted Half Page) takes the employment classifieds section of the newspaper as its departure. While the blank squares of the crossword puzzle drawings retain some of their anonymous potential, the text that remains visible in the help wanted work speaks more directly of the human stories that draw Dean to newspapers. 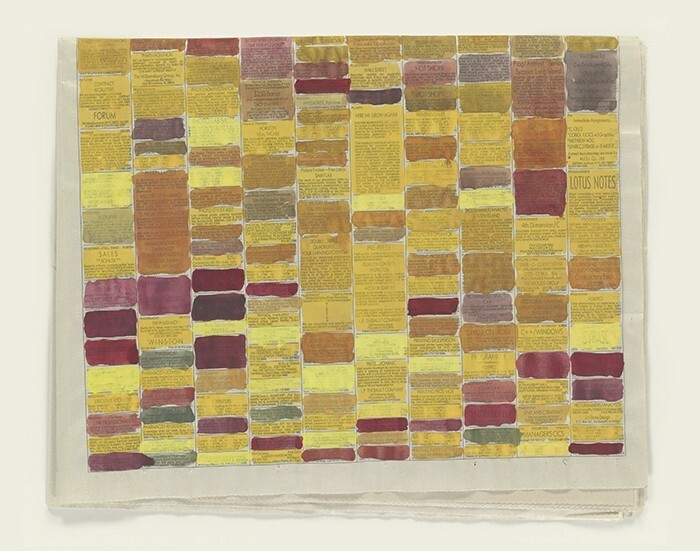 These stories are both obscured and highlighted by Dean’s fields of colors, which differentiate each ad, each square, hinting at encoded connections between seemingly distant parts—at the possible overlap between the carpenter, the pharmacist, and the picture framer. In his contemporary video pieces, Dean examines everyday activities until they dissolve into separate universes of color, which remain connected to the original activity but which also have their own rules. Through their indecipherable codes of color, the earlier watercolors in this exhibition similarly point to social connections across time and space. Dean’s watercolor washes over everyday objects and somehow, through his mindful modulation, he seems to penetrate to this underlying universe. The windows these works open, from the routine parts of our life into the world of color, reveal the indefinite, the loopholes, and the hidden affinities between our separate quiet mornings. Stephen Dean (b. 1968, Paris, France) was awarded the Altadis Prize for Fine Arts (2004) and a Rome Prize (2009). Recent solo exhibitions have been held at Tokyo Wonder Site Institute of Contemporary Art and International Cultural Exchange, Japan (2008); Sara Meltzer Gallery, New York (2009); Galería Max Estrella, Madrid (2009); the Koldo Mitxelena Cultural Centre, San Sebastián, Spain (2010); Villa Medici, Rome (2010); Baldwin Gallery, Aspen, Colorado (2009, 2011); Casa Triângulo, São Paulo, Brazil (2008, 2011); and the Russian Museum of Ethnography, St. Petersburg (2011); the Baldwin Gallery, Aspen, Colorado (2013); and Ameringer McEnery Yohe, New York (2014). Dean’s work has been included in numerous museum exhibitions, most recently at the San Francisco Museum of Modern Art (2008); Garage Center for Contemporary Culture, Moscow (2009); The Frances Young Tang Teaching Museum and Art Gallery, Saratoga Springs, New York (2010); the Solomon R. Guggenheim Museum, New York (2010); the Petit Palais, Paris (2010); Museum Tinguely, Basel, Switzerland (2011); the National Gallery of Art, Washington, DC (2012); and Musée du quai Branly, Paris (2012). The artist also was commissioned by the New York City Department of Cultural Affairs to contribute a permanent installation to PS/IS 338 in Coney Island (2011). Dean lives and works in New York City. Emily Sessions (b. 1980, Philadelphia, PA) is a PhD student in the History of Art at Yale University, New Haven, Connecticut. She received her BA in Psychology and Anthropology from Brandeis University, Waltham, Massachusetts, and her MA in Art History from the Institute of Fine Arts, New York University. She has worked at such institutions as the Brooklyn Museum, New York; the Rose Art Museum, Brandeis University; and the Colección Patricia Phelps de Cisneros, New York. Sessions has published and presented on subjects ranging from medieval mappaemundi to relational aesthetics. She lives and works in New York City.